Hardwood flooring is trending to be the most popular style of flooring that homeowners choose. There are several key benefits and characteristics of real wood floors: it’s timeless, comfortable, warm and attractive. Real wood flooring makes a house a home. Homeowners choose hardwood flooring for their resilience, character and the increased value it brings to their home as floors provide a stunning backdrop to your space. If your home is on the market, the beautiful, stand out hardwood floors have a way of impressing prospective buyers. Cooler, Darker Colors: There’s a definite move away from warm tones (reds, yellow and red/brown undertones). Grey is the new, versatile “it” color and it shows no signs of slowing down. 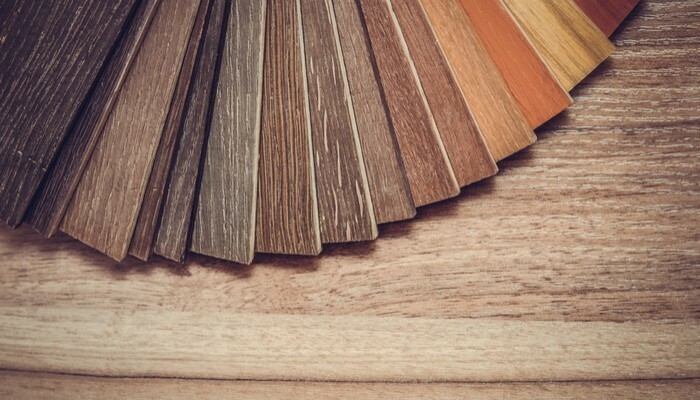 It’s neutral tones opens up the many possibilities of working palettes around it and pairing its hardwood color with other elements of the room can really bring the whole look of your space together. The new “Greige” (grey+beige) color is in demand and creates a minimalist feel with the warmth of beige. Elongated Tiles, Wider Planks: Planks that are 6-8” wide and 24’-48” long. This size lends to a comfortable, casual aesthetic. The wider planks also make older homes look more rustic and lend to the farmhouse appeal. In modern homes, the wide planks give it an elevated, contemporary feel. White Oak – Oak accounts for approximately 80% of hardwood flooring in the USA. White Oak is a perfect choice for those wanting a minimalistic, modern look but still retaining character and beauty. Another benefit is that White Oak is easy to maintain and more water resistant than its counterpart, red oak. Hardwood Cuts – More and more customers are seeing the value in rifted or quarter-sawn wood. Its linear pattern immediately draws you in and rifted hardwood expands more and contracts less, making it a great choice for those highly traffic areas such as the kitchen and living room. If you’re looking to add or upgrade your Hardwood flooring in your home, contact GC Flooring Pros for a free in-home consultation. Click here to get started today, on elevating your home.